Up until last week and the whole month of November I had to switch to Linux as my primary development environment and before that I haven’t used Linux primarily for development since 2009 when I switched to OSX. And in more than a month I experienced how things have changed a lot in the Linux desktop landscape, I’ve spent quite a bit of time trying to piece all these components together so hopefully this will you some time. 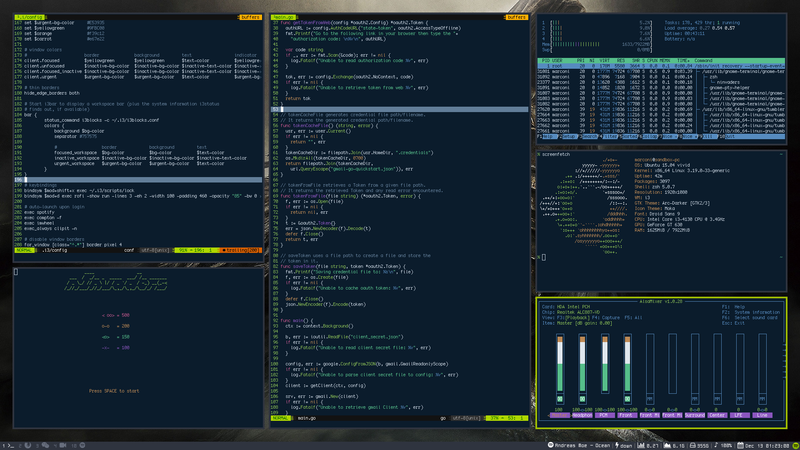 This is a tiling window manager just like xmonad and several others. But I’m using a fork which is actually called i3-gaps, the main difference being that windows have configurable gaps in them just like in the screenshot. bindsym $mod+d exec rofi -show run -lines 3 -eh 2 -width 100 -padding 460 -opacity "85" -bw 0 -bc "$bg-color" -bg "$bg-color" -fg     "$text-color" -hlbg "$bg-color" -hlfg "#9575cd" -font "Ohsnap Bold 18"
I made a backup of all my configuration before I nuked my PC, feel free to use them. Also most of what I’ve used come from this great video series from Code Cast which you should totally watch.